Are Dried Up Strawberry Plants Dead? Q: Are Dried Up Strawberry Plants Dead? 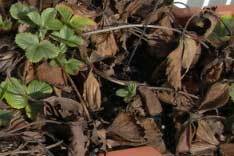 Answer to: Are Dried Up Strawberry Plants Dead? Thanks! The goal for Strawberry Plants .org is to be the one-stop-shop for everything related to learning about strawberries, buying strawberries, growing strawberries, and using strawberries, so I am glad you have benefited from it. There are a few things that may be going on with your strawberry plants. While strawberry plants are considered perennial, each individual plant won’t live forever. Generally, a strawberry bed will start losing its vitality after it peaks in the 3rd or 4th year. Sometimes the old plants just die. As your bed is 5-6 years old, the few plants that have died may have just given up the ghost. It is also possible that the fluctuating weather has also put extra stress on them (particularly the heat) and their shallow roots causing the dried up plants to have met an untimely demise. My guess is that the combination of age and weather has caused the plants to die. However, there is a host of pests and diseases that can weaken/infest strawberries. See the Strawberry Plant page for more info on those. Also, I would recommend replanting. You can use the guide on the Transplanting Strawberries page to make sure your plants are healthy and vigorous strawberry producers each year. If more plants die, you may want to have your soil tested by an Extension Agent to rule out disease or pest infestation. I hope that helps! I live in zone 5 and I just planted strawberries for the first time last spring. They did great all year. I covered them this winter with straw and just uncovered them and they look 90% brown. Is this normal or did they not survive the winter? The plugs usually survive better than the bare-root plants. But, either way, try to make sure you get the right varieties for you location. Good luck! I purchased a bag of 10 strawberry seedlings from Home Depot 3 days ago. Bags were sold in garden center in a cardboard box. Since the plastic bag was green, I couldn’t see the condition of the seedlings inside. Opened them yesterday and they were all brown and kind of dry. Now, I would think if something was past it’s shelf time that the store would’ve taken them off. Having never planted strawberries before and not know if this was normal or now, I separated and planted them in a mix of organic potting soil and soil specifically for fruit and mixed in tomato fertilizer since my research told me that strawberries love tomato fertilizer! Watered thoroughly and have decided to wait it out, but saved the packaging and took photos in case they are really and truly dead and need to return. Only $3.98 for pack of 10. Not sure what they’re supposed to look like out of the package as the diagram on the packaging instructions don’t really help. I didn’t see a brand name on the photo I took so I can’t even look them up and they’re not on the Home Depot website either. I’d like to know if it’s normal or not for the seedlings (roots and crowns) to be brown in the package or should there be some sign of life like green shoots or leaves. They shouldn’t be brown. They should be green and vibrant. However, they might still be alive if the crowns (at soil level) are still alive. I’d give them a few days and see if they perk up or grow new green shoots from the center. If they do, they’ll likely be fine. If they don’t, they are likely kaput. Good luck! I moved into a home with really nice garden beds. There are a bunch of Strawberry plants in one of the beds that are growing nice and green There are a lot of brown dead strains mixed in with them. I am afraid to damaging the good ones by removing the dead ones. Do I need to do anything or can i just let them go? Thanks. You should remove the dead ones. The damage that will be done by pathogenic fungi that will end up growing in the dead/decaying vegetative matter will cause much more damage than will removing the dead plants. Good luck! Hi, I planted some strawberries this year and they seem to produce a decent crop. But then, when I examined the plants, the older leaves are turning brown while the new leaves grew happily. Do the older leaves die out because of age or something lacking? Yes, the older leaves will die, wilt, turn brown and fall off as part of the normal growing cycle. If this process happens rapidly, there is something else likely wrong. New, bright green leaflets will grow from the center of the crown. Good luck! To get the most fruit in the spring, you have to make your strawberries as happy as possible in the fall. The perennating buds that become flowers and strawberries in the spring are actually formed in the crown during the previous fall. So, make sure you continue to take care of your strawberry plants for the second half of each year (i.e. after they have fruited). I’d recommend starting here. Good luck! If they look totally lifeless in the springtime, they likely died. You may want to give them another week or two and then replace them if they haven’t perked up. Good luck1! I didn’t think they were quite dead, but while we’re on the subject of dried up Strawberry leaves, are they safe to use as Tea? Tea is a dried or powdered laef, after all. I personally wouldn’t use dead outdoor leaves in tea. I’d pick living ones and dry them. First, the biological breakdown of healthy components occurs in the dying process, so the dead leaves aren’t going to contribute nutrients or flavor like picked and dried leaves can. Second, outdoor death is followed extremely rapidly by bacterial and fungal contamination. So, leaves that are dead and brittle are often laden with microbiological spores and nasties that you probably don’t want in your tea. True, if you boil the water, the organisms may be killed. But, who wants microscopic carcasses in their tea? Just my two cents! Good luck! I just wanted to say that I had 2 strawberry plants that my friend/landlady gave me , they looked all brown and dead but I just pruned them back the dead leaves and stems and re potted it , gave it plenty of water and torn up leaves that was on my lawn to give it nitrogen and it’s come back to life lovely , in just 4 days it’s all green and happy and the strawberry heart is showing so that’s my tip for bringing old plants to life ! I’m going to get it some food tomorrow and making up a mulch ready to pot it in a bigger tub or hanging basket and fingers crossed I will get some delish strawberries this year !! I will keep you all posted . It sounds like you are on your way to strawberries this year! Good luck, and thanks for sharing! Okay, loving your site and following some of the other issues, and reading more about the planting part. I my previous post I mentioned I planted them in a strawberry pot (whatelse, right?..they look so cute in them! ).Well, now I am wondering if I planted them too deeply inside the pot! It looks like that joint between plant and roots is critical. If I had the whole bottom inside the pot and not just the top, would that not be a possible cause of failure? Waiting to hear what you think. Thanks so much. Yes, if you planted the crown (the joint between roots and leaves) completely beneath the soil, that could have killed the plant. 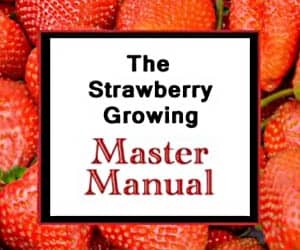 You may want to consult this reference page for more help growing your strawberries. Good luck! Hi. I am so happy I found your site! I have the same question that is on many minds..how to tell if a dried up looking strawberry plant is dead!! I have some that lived over in my green house, but these were in a topsy turvy bag all winter and after readng the other comments, I am declaring them dead! HOWEVER I have another question. I planted several different kinds in a big strawberry pots of the Mexican design last year. The plants grew huge, and healthy, but I bet I never got a handful of berries off the whole lot. I am assuming it was the soil. I did use miracle grow on them, and they looked beautiful, but the berry count is so low I almost didn’t replant for this year, but I did, and in much better soil. Starting to look good, but any idea why I have gotten hardly any berries off them in two years? Could they have been old plants when I got them and died of old age as you commented to someone else? Other people with the same kinds can hardly eat theirs fast enough. Help!!! Love berries, and so wanted to be successful..Maybe the compost will make the difference? Thank you so much.. There are actually several reasons why strawberries don’t set a good harvest of strawberries. See here! Good luck! Yes, it sounds like they are dead. Since you got them from Home Depot, you should be able to return them for either new ones or a refund. This should help with the planting. Good luck! Is there a time that strawberries go dormant and when is it? I planted my new strawberries this spring and they were doing great. They produced lil berries but then resently they have started drying out. It this normal? If so what do I do next to preserve them for next year? They should not go dormant before the temperature in your area drops into the twenties for a few nights in a row. If they are drying out and turning brown and the temperatures are still warm, they likely have another, more significant problem. If it is cold there, see the growing strawberries reference page, and use the table at the top to navigate to the information you need. Good luck! Water them thoroughly and see if the crown sends new leaf stems up. If that doesn’t happen after a few days of watering, they are goners. Good luck! i have 2 strawberry plants that were given to me about 2 weeks ago and i forgot to plant them. they have been sitting on my front porch and appear to be dead any tips on how to bring them back to life? or if i can? thanks! All you can do at this point is water them thoroughly, keep the soil moist thereafter, and hope that a tiny spark of life remains that can be coaxed back. Good luck! I have ozark beauty strawberries too. I planted in a strawberry planter pot last summer and over winter I left them outdoors but wrapped the pot with a tarp. When I took the tarp off this spring some of the plants were green but shortly afterwards they all turned brown and dried out even though I let the spring rain water them. However I never like to give up on a plant until I’m absolutely sure. I just let the rain water them and today I noticed 2 new green shoots coming out of the old dried plants! I think I will feed them with some organic fertilizer. Heather- I would look at the roots and see if they look alive. If they had been covered with a tarp, they need to be introduced to full sun gradually. If they go from no sun to full sun without any time in between, the ultraviolet radiation from the sun will scorch/kill any tender green vegetative matter on the plant. The crown usually survives, however, and will put out new leaves, as it sounds yours is doing. Good luck, and thanks for sharing! First let me say what a wonderful site and resource! This question is related to the above question about dried up or dead plants. I bought some ozark beauty strawberry starter plants last year, the brand is ‘Platinum Performers’. They got misplaced inside the house and I have just found them. Is there any possibility that they are alive? They were stored indoors, inside a cardboard box in their original packaging. Thanks for the compliment! Unfortunately, no, if your plants have been indoors without care since last year, they are almost surely dead. Sorry!